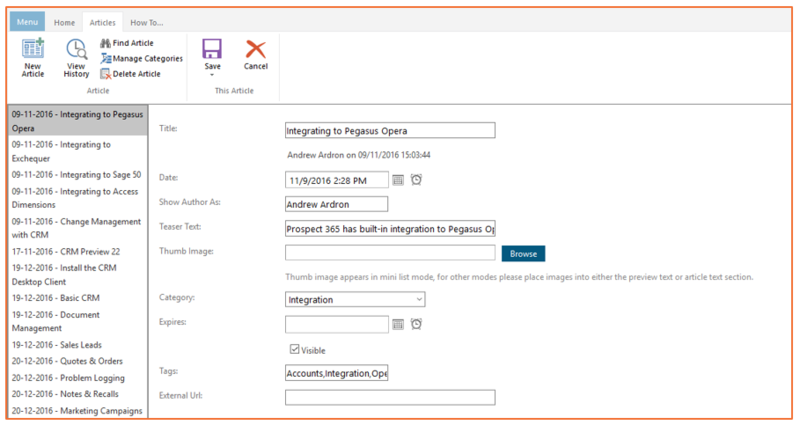 This article outlines how you can easily create articles within the CMS. Articles can be viewed on your site via the articles plugin. Note that the articles plugin is not backwards compatible with previous news plugins. Once you have accessed the CMS and selected the site you wish to alter the Articles Plugin can be found from the ribbon bar. Selecting Articles will then load up the options shown below. This will show you all the previous articles which have been created, on the left hand side, and the main details about the article on the right. 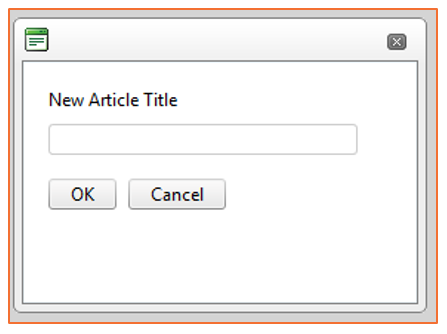 To create a new article you need to select ‘New Article’ from the top ribbon bar. This will then ask you to give the new article a title. This will be the name used when searching for and selecting this particular article. You will then be able to enter some additional information relating to that article. The date that the article will display. This defaults to the created date, but can be modified at will. The author the article will report to be from. This defaults to the user that created the article, but can be modified to any value. This is the teaser that will appear in the mini article list. It should give a brief summary of the article. The thumbnail image to use for this article. The category for this article. Categories can be created via the New Category button in the ribbon bar. The date at which the article should no longer appear on your site. A comma separated list of tags for this article. The articles plugin can be used in tag cloud mode, which will provide a cloud of tags used in articles. Tags also appear at the bottom of articles that use them. Clicking on a tag will take you to a list of articles that use that tag. If you want this article to link to an external page rather than to the articles plugin, you can specify this link. This is the text that appears both in the article list and at the top of an article’s detail page. It will usually contain the first couple of paragraphs of the article, before the “Read More” jump. The “Read More” link will take the user to the full article view, at an anchor tag that starts them at the end of the preview text. The article title will take them to the top of the full article view. This is the rest of the article content that leads on from the preview text. It will appear after the “Read More” anchor tag. If you have copy and pasted the information into the articles plugin then the layout and font etc. is not always carried over correctly. This means that sometimes you will need to alter the HTML. This can be done by selecting on the HTML button at the bottom of the Article Text section, this is also the case for the Preview Text section. It is then simply a case of locating the font name and changing it to the correct one. The easiest way to complete this is to use‘Ctrl F’ and then scroll through the corresponding text. To make any images which you have added to the article responsive the following text needs to be added to the HTML. This should be added to any image with the ‘IMG’ tag. This option is available once you have accessed the plugin menu and then selected ‘Manage Categories’. This will then allow you to add and alter current categories which are used to group where the articles will be displayed. You can create a new category by selecting the ‘New Category’ button and giving it an appropriate name. This will then be added to the list shown on the left hand side. You can then decide where in the list it will appear,this will then impact on any drop down or other menus where the categories are displayed.